I encourage my clients to get involved with blogging in some way. Even a focused strategy of regular commenting and guest blogging on relevant blogs can have value and significant impact. 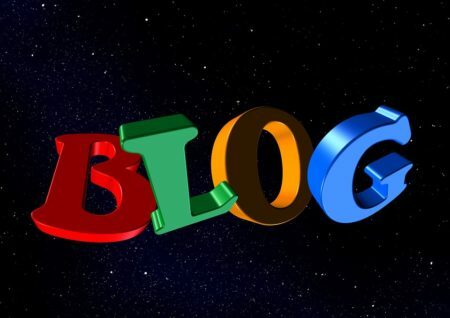 If you like to write − and perhaps have a number of articles or white papers under your belt − and have something to say about your industry and areas of expertise, consider giving blogging a try. Starting your own blogsite is probably the best option, if you can invest the time in setting up a site, writing regularly, and maintaining the site. Alternatively, LinkedIn offers a long-form publishing platform (it used to be called Pulse) for any member (paid or not) to write content whenever they wish. This LinkedIn platform offers many of the benefits of having your own blogsite, without most of the inherent hassles. 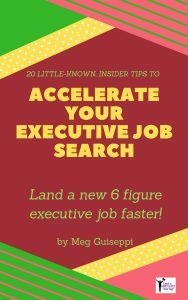 Top-level executives (and other job seekers) who blog in some way are getting on the radar of executive recruiters and employer’s hiring decision makers, and landing jobs. Hiring authorities found them when they were keyword-searching online for viable candidates. 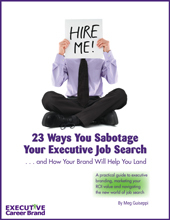 Some of these executive job seekers were offered opportunities in the “hidden job market” — positions not posted anywhere — because their blog writing demonstrated their subject matter expertise and credibility, and positioned them as a good fit for a company. Put yourself in the shoes of people assessing you as a candidate. When they Google a candidate and find few, if any search results associated with their name, they may pass on that person. 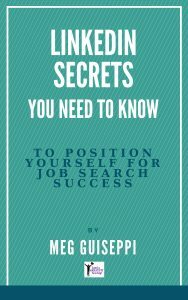 But when they Google a candidate and find plenty of diverse content associated with that person’s name − including well-crafted blog posts and/or articles − that person is more appealing and more likely to be pursued. Blogging doesn’t have to take a lot of time. Don’t assume that a blog won’t be of benefit unless you post several times a week. I you have a blogsite, you can set up your blog so that posts do not include dates, so no one will know your posting frequency. Or, you can set up your blog to look like a career web portfolio or personal website with no blog stream at all – just pages and perhaps several important articles or white papers. For both scenarios, you have the ability to publish new blog posts whenever (and if ever) you feel like it. Although longer posts (1,000 words or more) are best, you don’t have to publish lengthy manifestos every time you write. Frequency is important too. If all you can manage is a 300-400 word post a few times a month, you’ll still be way ahead of candidates competing against you who aren’t blogging at all. And, to save time, you can break up some of your extremely long posts into a series of several shorter ones. So, how do you come up with good ideas for blog posts? Demonstrate your subject matter expertise and thought leadership. 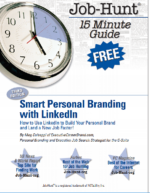 Advance your brand promise and ROI to your target employers. 1. The topics you write about should represent your areas of expertise. They are also the relevant keywords and phrases you’ll use in your personal marketing materials for Search Engine Optimization (SEO), to optimize your online presence. 2. Google those same keywords to research what others are writing about those topics. Use this research to write more blog content. Job position(s) and industry you’re seeking. Names of subject matter experts and thought leaders in your industry and niche. Names of any other people whose radar you want to get on. 4. Subscribe to your target companies’ blogs and those of industry thought leaders and subject matter experts. Google their names and relevant keyword phrases to find relevant blogs. See what they’re writing about, and blog about the same things. 5. Subscribe to (or just read) industry publications. 6. Peruse the big publications – NY Times, Wall Street Journal, Forbes, Fortune, etc. – and industry-specific publications for industry news. 7. Check out the LinkedIn long-form posts of people you’re following on LinkedIn, and those of your LinkedIn “Influencers”. 8. Re-purpose articles and white papers you’ve written. If they’re too long for one post, break them up into a series of 2, 3 or more. For even better impact, coincide these kinds of posts by posting a comment on the original blog post. 10. Keep track of good posts by other bloggers you’ve read all week and do a weekly roundup listing 4 or 5 posts with links and include a brief encapsulation. That takes almost no thought or time, and makes connections with other bloggers! In your posts and post titles, frequently use relevant keyword phrases, and mention people and products of your target companies. Someone at those companies has set up Google Alerts to monitor mentions of these names and products. Recruiters and employer’s hiring decision makers search industry-relevant keyword phrases online and have Google Alerts set for those keyword phrases. These people are very likely to find you. 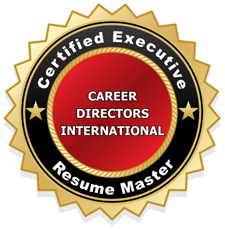 Previous Post: « Do Cover Letters Really Matter in Executive Job Search?